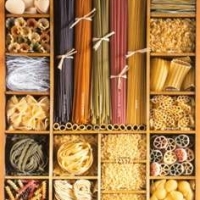 This a different way to make your lasgna the star of a meal. I have also put leftover lasagna in the roasted peppers .And if you have purple, yellow, red and green.....mangia bene! sprinkle inside of peppers with salt. Meanwhile brown the ground beef, garlic, mushrooms, salt, pepper and half the garlic powder; drain fat. Stir in spaghetti sauce and adjust seasoning as needed. Combine the ricotta cheese, egg and 2 tablespoons parmesan cheese in a small bowl; season with salt, pepper and remaining garlic powder. Divide ricotta mixture between the pepper halves. 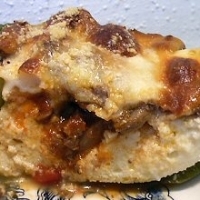 Top ricotta mixture with meat sauce; mound the mozzarella cheese over the top of each pepper. 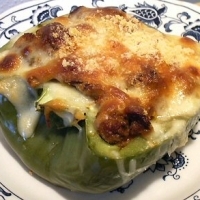 See Lasagna Stuffed Peppers for more. If you read my profile, you will see that lasagna is my favorite food. My family also loves stuffed peppers. I can't believe you found a way to put the two together. Thank you so much for this recipe that I will be trying shortly. Very nice!! I like this idea very much. Like someone said, lasagne without the noodles. Mmm! Sounds perfect. I was surfing for the best sounding Stuffed Peppers recipe, and yours hit the nail right on the head. Thank you! HOW DID I MISS THIS. OMG, great idea. I love this site! Thanks for posting it.! this is a wonderful idea... We always have that little bit of left over lasagna... this would bring it back to life! This is great - I have a green pepper plant producing like crazy = I know what we are having this weekend! What a great idea!!! YUM!!! This I gotta try. Thank You!